Despite arriving at a lower figure for the value of the UK bicycle market than others, research specialist Mintel has high hopes for the bicycle industry’s near future. Mintel forecasts the bicycle market will grow 23 per cent in the next five years, reaching £869 million by 2017, from £705 million in 2012. The research also found that, perhaps surprisingly, consumers aren’t attaching as much importance to bike brand as to other factors, putting newer brands on a level playing field with established names. According to Mintel, men are more likely than women to attach importance to the specification and equipment on a bicycle (36 per cent vs 27 per cent) and the brand (24 per cent vs 18 per cent) is also important to them. In contrast, women are more concerned than men about a bicycle being an affordable price (80 per cent vs 74 per cent), its styling, colour or décor (29 per cent vs 19 per cent) and the quality of after-sales service (17 per cent vs 12 per cent). Michael Oliver, Senior Leisure Analyst at Mintel, said: “Overall, perhaps the most surprising aspect is the lack of importance attached to brand, with price, specification and styling, colour or décor being seen as more important than whether a bicycle is a brand that the potential buyer is familiar with. Leisure riding is in front of other ‘disciplines’, with two thirds (66 per cent) of cyclists riding at the weekends. General purpose riding, such as going to the shops or visiting friends, is also extremely prevalent with four in ten (40 per cent) cyclists riding for this reason. Meanwhile, 25 per cent of cyclists use a bicycle to commute and 13 per cent use a bicycle to go to their place of education. Off-road riding trails other sectors at 13 per cent. Anecdotal evidence points towards a lot of people taking up cycling last year were re-commissioning old bicycles they already owned, rather than buying new. Previous Mintel research has found that one in two (49 per cent) Brits feel it is too dangerous to ride a bicycle on the road. A further 41 per cent of Brits said having a dedicated lane or routes would encourage them to cycle more often (peaking at 46 per cent in London) while 40 per cent say that dedicated bicycle lanes and routes would encourage them to cycle more often (London showing the highest level of agreement at 47 per cent). 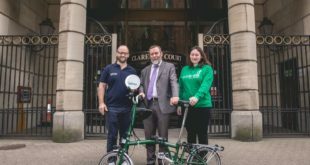 Oliver added: “The tide appears to have turned in central and local government in terms of their attitudes towards the provision of cycling facilities and this could result in making cycling a lot safer, particularly in towns and cities. If this happens, the evidence from several trial schemes around the country shows that there will be strong growth in cycling usage and this can only be good for sales of new bicycles in the long term.